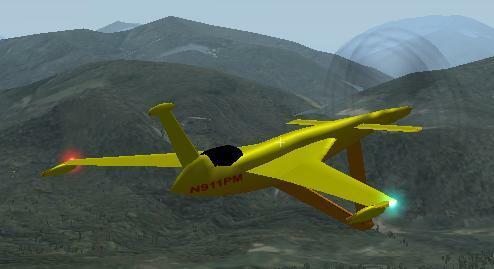 Canard Light Sport Aircraft ideas and concepts page. 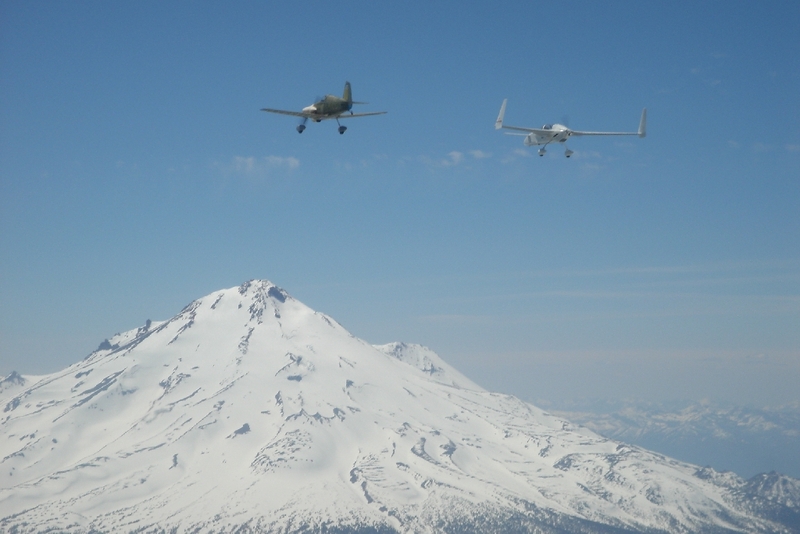 Slow-EZ: The idea behind the Slow-EZ, is to make a Light Sport Aircraft (LSA) option for all those old and aging Long-EZ flyers out there. By simply building and installing a new set of wings and canard, changing the nose gear from retractible to fixed, and changing to a "climb" propeller to reduce maximum speed, the Long-EZ becomes a Slow-EZ. The Slow-EZ parks on the "tail", an idea borrowed from the Vari-Viggen. Special attention must be made to build light to stay below the gross weight limit, and in some cases the LSA weight limit may preclude carrying a passenger or limit fuel capacity. FAA regulations require that any Long-EZ to be converted to a LSA will need to be de-registered, parted-out, and the new Slow-EZ built from the parts will need to be inspected and registered as a completely new amateur-built aircraft. Hopefully, 3rd Class medical reform will pass soon, making this conversion unnecessary for most Long-EZ flyers. However it would still be desirable to have a safe, stall-resistant canard LSA on the market. VTOLC: Inspired by Paul Lamar's ideas. 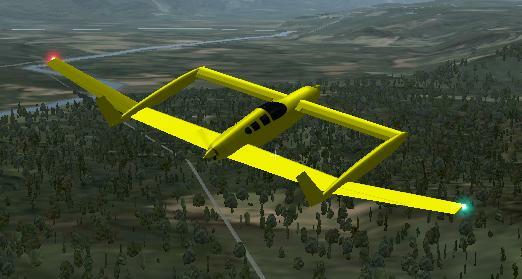 VTOLC is a vertical take-off and landing canard aircraft. It will take-off and land like the 1950s Tail-Sitters developed by the US Air Force. Unlike it's predecessors, vertical landing will be done by GPS, computers and sensors. VTOLC is based on the Long-EZ but highly modified with the engine and the pilot swapping locations. VTOLC is a tractor canard aircraft with two large counter-rotating props on the nose. The canard no longer performs as a stall limiting device except during engine-out glide. A retractible strut allows easy entry into the cockpit, and also provides the option of taking off and landing conventionally, as well as gliding to a conventional landing in case of engine failure. NeoVoy: This aircraft is based on the Rutan Defiant for twin engine center-line thrust safety, but the wings and canard are modified to high aspect ratio for superior glide performance, and two boom tanks are provided similar to Voyager for extremely long range. With twin engines, long range, and excellent glide performance, NeoVoy would be one of the safest aircraft in the world to operate.